Birthday: 29 October Zodiac: Scorpio Blood Type: A Hobby: Shopping Favorite Color: Dark Red Favorite Stone: Garnet Favorite Sport: Rhythmic gymnastics Favorite Class: Physics Least Favorite Class: Music Favorite Food: Green tea Least Favorite Food: Eggplant Sailor Pluto first appears as a Senshi in the second major story arc, and her civilian form is not shown until the third. She is unique among all the characters in that she is stationed at the Door of Space-Time, with the specific duty of forbidding anyone to pass through it without permission. She has powers that relate to both time and the underworld. Sailor Pluto is not introduced until late in the Sailor Moon R series. She is the soldier who guards the gates of time. She is first seen contacting Chibiusa through Luna-P. Sailor Pluto refers to Chibiusa as "Small Lady." Chibiusa usually calls Sailor Pluto by the nickname "Puu". She acts as Chibiusa's guardian. After the events of the second story arc, she leaves the gates of time to temporarily live as a human being, joins the rest of the Outer Senshi, and becomes a university student studying physics. The exact nature of how she leaves her post differs between versions; in the manga, she is reincarnated in present day by Neo-Queen Serenity after sacrificing herself during the second arc, while in the anime Neo-Queen Serenity allows her to leave. Even in her civilian form, Setsuna is the oldest of the Sailor Team, around her late teens or older. Her personality has been described as distant and somewhat lonely, however she does consistently display warmth and affection toward Chibiusa. When she reincarnates, she becomes more friendly, but is still not very emotional, although there are moments in the manga where she expresses much more emotion than the anime. She later cares for Hotaru along with Michiru and Haruka. Unlike the other Senshi, it is questioned whether she is fully human—she has been described as "a goddess, eternally guarding the Portal of Space and Time". Sailor Pluto's precise abilities and knowledge of the past and present are only vaguely defined, although a common theory is a form of omniscience, possibly due to her portrayal in the anime. For example, she was presumably aware of the two sailor soldiers carrying the mystical objects they were hunting for, but did not inform them and allowed various people to be attacked. (This differs greatly from the manga, and may be a simple continuity error.) This omniscience is represented as being able to watch through the gates of time, and such. Sailor Pluto appears in just a few TV episodes. Unlike Sailor Neptune and Sailor Uranus, she is sympathetic toward the Guardian Senshi, and assists them on several occasions. During the second story arc, she allows them to travel through time even though this is not ordinarily allowed. In the third story arc, she often extends help or advice to Sailor Moon and her companions even when Sailors Uranus and Neptune want the two groups separate. Later, Setsuna joins the Guardian Senshi in investigating the true identity of ChibiChibi. In the manga, she is an inspiration to Ami, and her relationship with Ami gives Sailor Mercury additional strength to power-up to her Super form. 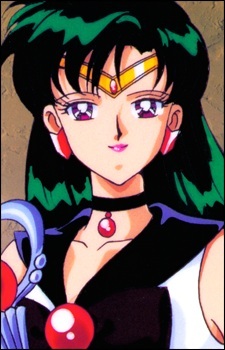 Sailor Pluto has additional, less cited influences and spheres of dominion in her manga incarnation, influences that are vaguely suggested in the anime, but never made explicit. Sailor Pluto is much darker in her initial form in the manga, identified as the "Guardian of the Underworld" with very dark skin and a black sailor uniform. She is also stated to be the daughter of Chronos, god of time. She is a ruthless soldier who follows rather exacting laws, executing any intruders who dare violate the underworld in search for the Gates of Time. She nearly kills Sailor Moon before realizing who she is, stating that "all who break the taboo must be eliminated". Luna also states to the others that no one is to even know that she (Sailor Pluto) exists, due to her dominion and nature, and that to her knowledge no one has ever seen her. Luna calls her a "lone warrior," noting the sadness in her eyes. In the manga, Pluto's death scene vaguely implies a romantic interest in Endymion, though this is never explored again. In the Sailor Moon musicals, Sailor Pluto has an unrequited love for King Endymion. It is explicitly mentioned in Eien Denetsu and Shin - Densetsu Kourin, in the song Onna no Ronsou ("Woman's Conflicts"). In the manga, it can only be inferred from depictions of Pluto blushing while around King Endymion, her reaction when he runs to comfort her during her death and in artwork depicting Neo-Queen Serenity, Pluto, and King Endymion. A small quirk occurs in continuity between the manga and anime. Sailor Pluto (temporarily) expires in both, but at different times; her death in the manga occurs much earlier and reawakens the good side of the possessed Chibiusa. However, for all intents and purposes, in the manga the technicality of Sailor Pluto existing outside of time means she is able to be reincarnated as a normal woman while still existing back at her post at the Time Gate.